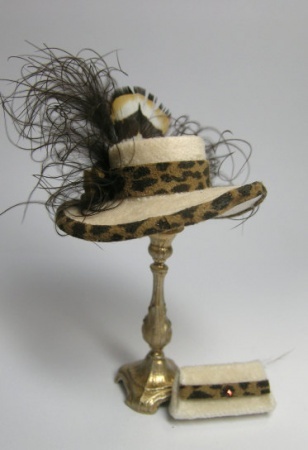 This petite little gem is made from creme velvet and trimmed with an awesome suede like trim that has leopard print. You could also substitute animal print fabric for the trim. Working with velveteen requires modification to the pattern to allow for the thickness of the fabric, so this style is specifically intended for thicker fabrics. The matching clutch is very chic! Download is in PDF format. It contains complete instructions with dozens of photos, full size pattern pieces for the hat and clutch.